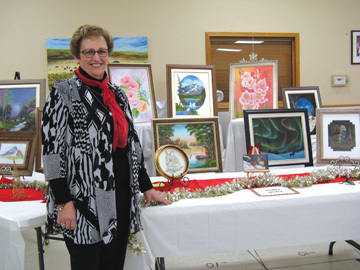 Commentator/Courier File Photo Ronda Noble displayed her artistic creations at the art and craft show on Nov. 30. For nearly 30 years the Golden Age Centre has been the place to be for seniors in the Bow Island area. The group hosts weekly and monthly events throughout the year, with all of its members being able to partake in whichever they choose. “Our entertainment committee works really hard to keep events going throughout the year,” said committee member Lisa Braat. “We’re open to everyone 50 and over and we do big events through the year and we have things we do every week. The centre’s art club meets every Monday and has been doing so for years and the group also hosts cribbage tournaments every year. Most afternoons the building has some sort of pool, cards or bingo running for anyone to take part in. The group’s building is called the Bow Island and Area Golden Age Club Recreation Centre and it will see roughly 20 people passing through each week, with big events drawing more than 50 to the building. “Coming up we’re sponsoring the Great Canadian Barn Dance,” said Braat. “We’re sponsoring it because our centre actually isn’t big enough for it. The dance is being held at the Burdett Centennial Hall and Braat says she is hoping to see more than 100 people at the event. Braat says people are thankful for the building and it’s events. On April 6 the group is hosting a big cribbage tournament and is expecting 85 players from Bow Island and the surrounding area. The building originally opened in November of 1990 and a membership is $15.